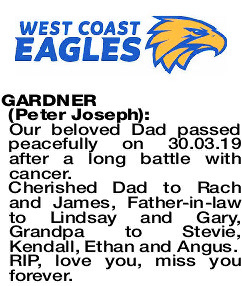 PETER JOSEPH Our beloved Dad passed peacefully on 30.03.19 after a long battle with cancer. 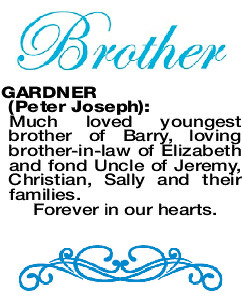 Cherished Dad to Rach and James, Father-in-law to Lindsay and Gary, Grandpa to Stevie, Kendall, Ethan and Angus. RIP, love you, miss you forever. 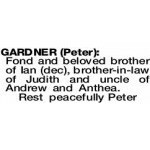 Fond and beloved brother of Ian (dec), brother-in-law of Judith and uncle of Andrew and Anthea. 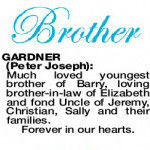 PETER JOSEPH Much loved youngest brother of Barry, loving brother-in-law of Elizabeth and fond Uncle of Jeremy, Christian, Sally and their families. 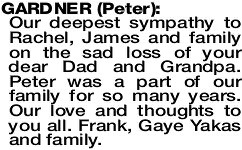 Our deepest sympathy to Rachel, James and family on the sad loss of your dear Dad and Grandpa. 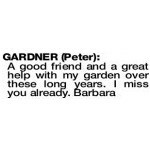 Peter was a part of our family for so many years. Our love and thoughts to you all. Frank, Gaye Yakas and family.